Event chairman Mr. Naresh Raisinghani, CEO & Executive Director, BMGI, kicked off reflecting the current realities in the Indian Commercial Vehicle (CV) Industry viz., unutilized capacities, YoY de-growth, dependence on GDP among others that would continue to detract the industry in the short term. He identified the opportunities, comparing the vehicle densities in India and the developed market, planned infrastructure spending and the opportunity for exports. Mr. Raisinghani urged the OEMs to take an active role by designing the product to the varied customer needs yet being sensitive to price; bringing the best of technology in the world to the widest market that India has access to and to focusing on designing plants for lean, in the short term. Appealing the tier 1 & 2 suppliers to look at cost cutting through a cost tree drill down; optimizing man-power, reducing material costs through value engineering & de-bottlenecking the Capex. He advised addition of products / service lines, entering new geographies and expanding reach through channels to enhance the top-line. Mr.. Raisinghani reminded the cyclical nature of the Indian CV Industry and signed off assuring that the market is only going to bounce back. BMGI unveiled a whitepaper titled “Forward and Upward - Coming Out of the Cyclical Downturn” that explored alternate business models and asserts that for the CV Industry to cease dependency on the volatility, an innovation in the business model innovation is the way forward. This could be brought about even through a cross industry synergy, where the challenges of one industry could as well be the core strength of the other. 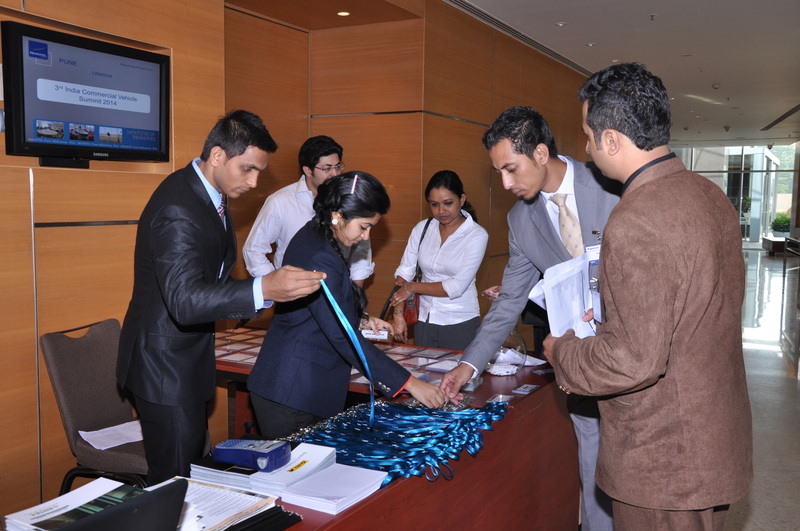 The paper was made available exclusively for the participants of the summit. other markets; provide more importance to after sales service and diversify offerings besides improving distribution channels to offer value added services to the customer. Providing a perspective on the future of Indian trucking, Mr. Shyam Maller, Senior Vice President, Sales & Marketing, Eicher Trucks & Buses, echoed Mr. Raisinghani’s views on the industry bouncing back pointing to the evolving market. Mr. Maller shared that the Indian CV market is no longer a duo-poly with more players than before, the country’s infrastructural needs through industry corridors, the government eventually going to implement the GST, the fact that a part of the market moving from opting for a basic product to products with higher power, better reliability & durability features. He shared actions taken by VECV towards offering fully built solutions like focusing on driver comfort & drivability, vehicle life-cycle profitability, optimized maintenance cost, high re-sale value for the owner, among others. Shyam shared how VECVs means to track customer voice is also evolving through utilizing new technologies. 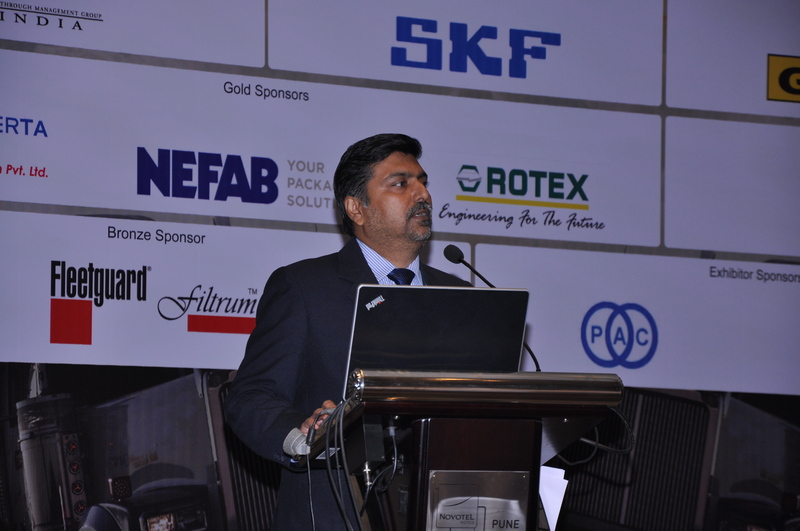 capacity mega trucks; higher energy efficiency through hybrids, electric CVs; and newer business models Pranab conveyed SKF’s specific solutions across the wheel end, the engine & the power train with a major driver being cost innovation and achieving low friction. Tapping on the promise of the Indian market, Mr. Vidit Jain, Technical Director India, Giti Tyres and his team provided an overview of the 30 year old singapore based company and their plans of expansion in India with their key differentiators. Catering to the rising importance and need for safety in CVs, Mr. Abhay Damle, Director, Central Institute of Road Transport (CIRT), Pune shared a possible solution through the application of event data recorders in Commercial Vehicles through which the people sitting in the vehicle and pedestrians alike getting real time information on what is happening to the vehicle and if something is going wrong. Explaining that an event data recorder in a CV, akin to the blackbox in an aircraft, records and transmits information in real time about the vehicle even to the detail of over-speeding, Mr. Damle insisted that a policy and a framework should be made mandatory in CVs that would be especially relevant post the events of harassment occurred in the Indian capital in the December of 2012. With more than 1.38 L people losing their lives in reported road accidents in 2012 with >70% of accidents attributed to driver’s fault and more than 50% due to unlawful speeds, a need for such a device is logical, he substantiated. Abhay concluded with a hope that more lives could be saved through making vehicles intelligent and that the device should be made easy to fit into the vehicle. regulations and the National Electric Mobility Mission Plan (NEMMP) 2020 that seeks to encourage manufacturing reliable, affordable & efficient xEV resulting in total xEV sales of 6-7 million units. She signed off saying that xEV is the future of mobility and innovation forms the core in how rapidly the solution can be viable. the traditional fuel tests and various specifications by various agencies and explained the various automotive oils HPCL offers along with its benefits before signing off with offering to assist OEMs in their tests and experiments. Recalling Ruben Rausing, founder of Tetra Pak that “A packaging solution should save more than it costs” Mr. Peter Bjelovuk, Vice President Business Unit Vehicle, NEFAB provided the value proposition by NEFAB in packaging solutions to the Vehicle segment. Sharing that NEFAB strives to reduce the total cost and environmental impact through their packaging solutions, Mr. Bjelovuk shared the “Total Cost” approach & the multi-material engineering approach adopted by NEFAB towards reducing the overall cost reduction. By adopting an effective packaging design, optimizing on modes of transport, efficient distribution and product protection, he outlined the areas where costs could be optimized. Comparing the road accidents in the global and the Indian context, Mr. Balraj Bahnot, Lead Technical Adviser, Rosemarta Technologies Ltd – an information & communication technology company, reinforced that the loss of life is the biggest loss due to an accident where in India, about 80% is attributed to the fault of the driver. Mr. Bahnot shared data based speed facts like speeds of over 5 – 10 kmph more than the prescribed speed limit in urban areas doubles the risk of a casualty crash and established that speed is one of the prime causes for an accident before sharing a possible solution through the product offerings from Rosemarta Technologies. With benefits like increasing safety and reduction in severity of crash, the indigenously designed speed limitation device would be a first step towards reducing the accidents, he advised. This coupled with a vehicle tracking system would complete the solution as there is no substitute for real time tracking of a vehicle’s speed that would not only minimize the severity of accidents, but, can prevent accidents completely, he conjectured. What is the influence of politics and policies on the industry? Mr. Amba Preetham Parigi, advisor to the NEA, India gave an understanding of the impact of politics & policies to the CV Industry. While the Indian growth story has never been so over the past 10 years and relevant policies that have been framed like the National Manufacturing Policy, Mr. Parigi touched upon the ground realities on how corruption and a lack of leadership is posing a threat to the growth story. Sharing the political landscape, Preetham projected the likely actions in the first 100 days post forming the government in cases of either a stable government or a hung parliament. The key difference being a long term view in the former and a short term views in the latter. Highlighting the lack of differences between party manifestos as both key parties seek to offer the same outcomes (100 new cities or 100 new urban clusters), Mr. Parigi explained that the actions towards growth remains the same, whichever party forms the government viz., developing industrial corridors or investments in infrastructures. He recalled that the success of building the Yamuna Expressway and other stories reinforces the faith despite the gloomy expectations from the government and regulators and with key policies like GST, Land acquisition & Rehab bill are bound to help the industry bounce back. He urged the industry to cheer up and advised the global OEMs to plan for their respective India story in decades and not in years. 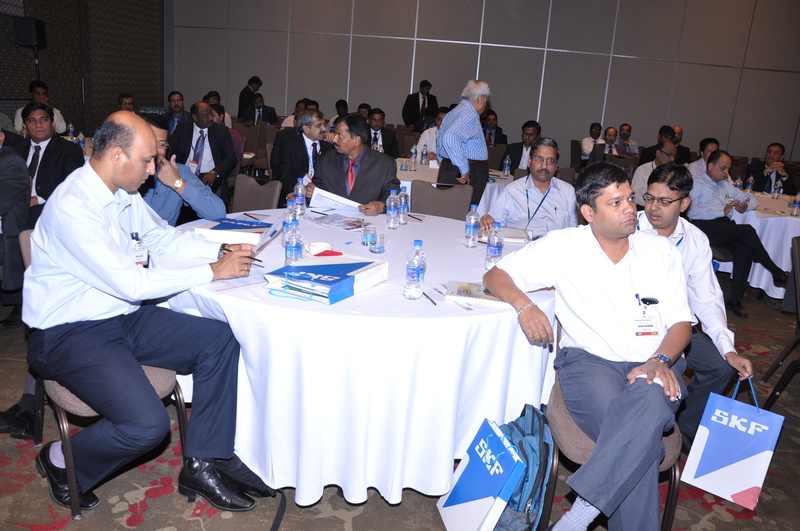 How to deal with technological & operational challenges in the OEMs? 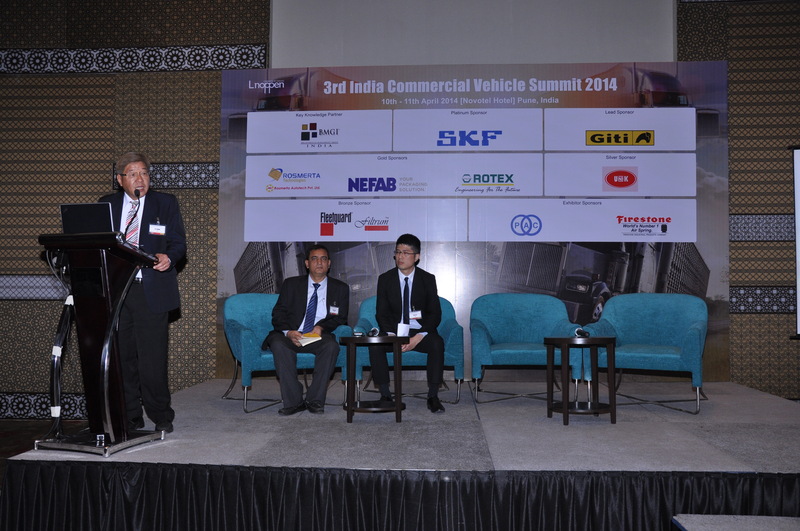 Mr. Nandkumar Khandare, CEO, Nissan – Ashok Leyland Technologies Ltd., addressed this in his brief presentation. In a world that is more globalized and urbanized, specific needs like need for quick launches in diverse markets, incorporate the best in the world, fatigue free driving, etc., emerge, Mr. Khandare noted. He articulated the technology and operational challenges and provided solutions that could help overcome the challenges. While the technology challenges included improving efficiency requires downsizing the internal combustion engine and managing of costs, light-weighting would be required to build greener vehicles, the operational challenges included having a mission zero defect production with no room for making errors and a pressing need for compressing the development cycle. He urged the OEMs to look at best practices, incorporating modular designs, manage complexity through a robust portfolio management while ensuring data integrity across the product life cycle. Exploring the opportunity of using alternative materials Dr. PKC Bose, MD & CEO, Saertex shared his views on the application of advanced composites for CV coaches and why the future would lie here. He made a case for advanced composites which are light in weight, superior in strength and can withstand greater fatigue. With Finite Element Analysis results proving ruggedness of the composites, he urged the OEMs to look for alternate materials for the CV coaches. Dr. Bose reminded the audience that technology disruption takes time but is absolutely critical to India’s future public transportation needs. for cost reduction can be zeroed in, he illustrated. With a case study and utilizing tools like Bio mimicry, TRIZ, Mr. Banerjee showed that not only is it possible but also the potential for CVs in India is high. What are the implications of stamping on light weight vehicle body constructions? Mr. Dileep Naik, Head – Auto Projects & Production Engineering, Tata Motors resolved this technical challenge through his presentation. He demonstrated that the material cost has not changed much from 2007 to 2014 but the composition has significantly changed leading to cost pressures with changes in material mix. While the body weight poses a challenge of fuel economy, emission norms and an increase in vehicle cost, he shared possible ways in which the body weight can be reduced that included use of high strength steels and reduction in number of parts among others. Given the fact that form-ability and strength are inversely proportional, Mr. Naik rounded up the challenges this may pose in the primary process of stamping from the perspectives of the process, design and also the tool manufacturing before suggesting that use of advanced simulation software, use of high strength steel in cold forming, advanced die steel material would indeed make light weighting possible. How can process transformations happen? 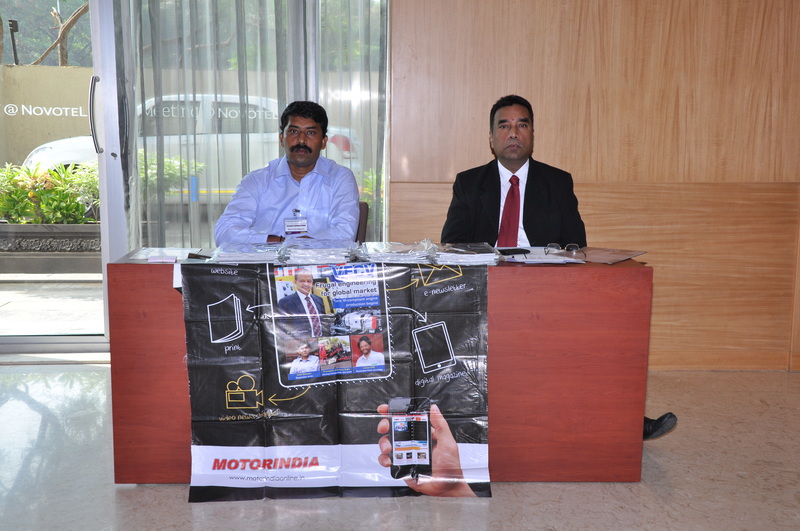 Mr. C P Kohli, Executive Director, Friends Auto India Ltd., demonstrated the answer to this question. Mr. Kohli shared how deploying the best practices like lean and Kaizens with an eye on culture can result in change. He shared his in depth understanding of implementing the change management process and drew examples from his experience of what works well and what doesn’t work. Mr. Kohli shared Friends Auto’s ambitious plans that the team believes is possible after the transformational changes reinforced their confidence. intelligence that makes faster adaption, he asserted through a case study and a 12 step process that results in creating value for customers and shareholders alike.